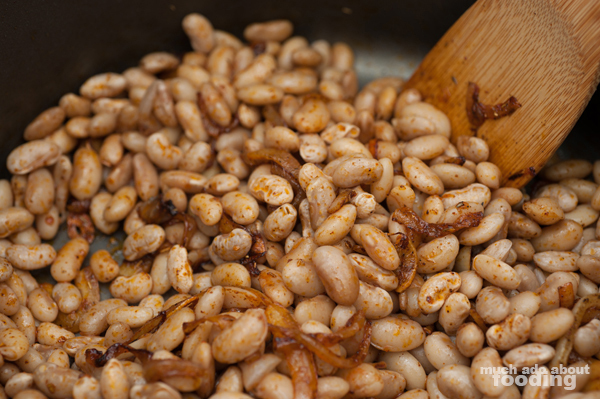 Peruano beans, also known as Peruvian beans, have been described as being pleasantly creamy but I didn't know exactly how creamy until I had some myself. Yum. Luckily, since I had read up on how creamy they were, I decided that it only made sense to use them in a fashion other than soup or on the side. I made them the main feature in quesadillas! These vegetarian pockets of cheesy, beany goodness need some salsa to spice them up and keep your tongue from sticking to the roof of your mouth from all of the tasty stickiness. I also added mushrooms to the mix for extra nutrients but you don't have to if you prefer to skip the fungi! *If you don't have time to soak the beans overnight, cover in cold water and bring to a boil in a pot. Turn off heat, cover, and let stand for an hour in the hot water. The beans take the longest here so make sure to have them wet and ready. Slice onions and garlic; saute in a saucepan until turning translucent. Add in chili powder, oregano, paprika, beans, and salt. Coat the beans in the fragrant spices. Stir for 2-3 minutes. Pour two cups of water over the beans and bring to a boil. Reduce to a simmer and cover the pot. Cook for an hour and remove lid. Fill with remaining two cups of water. Simmer without a cover for another hour to hour and a half or until most of the liquid has evaporated. In a small skillet, saute sliced mushrooms until browned. 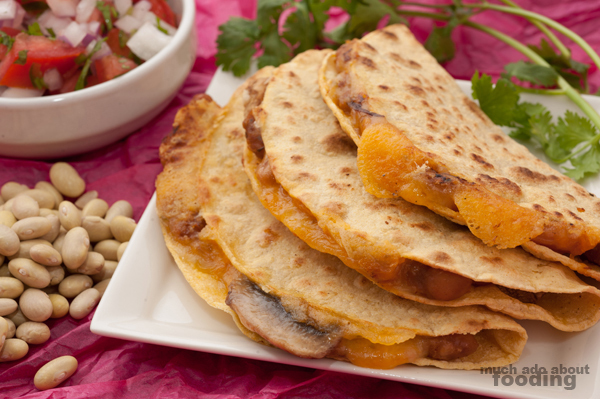 We used corn tortillas but if flour fits your fancy better, go for it. 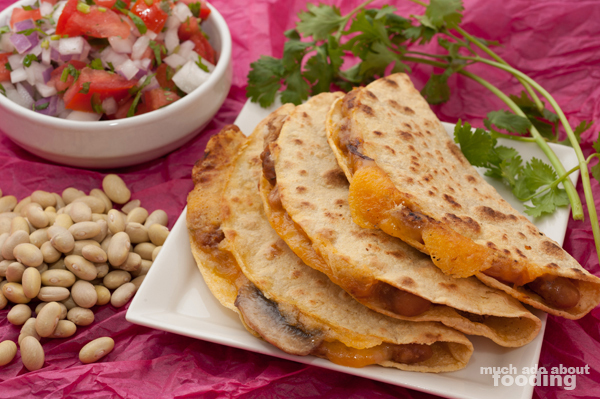 Spoon enough beans onto one side of tortilla on a hot pan and top with mushroom. Add in big heaping of cheese (1-2 Tbsps) to ensure a seal, and fold tortilla in half. Press down to meld ingredients together. Cook each side about 1 minute. Enjoy! 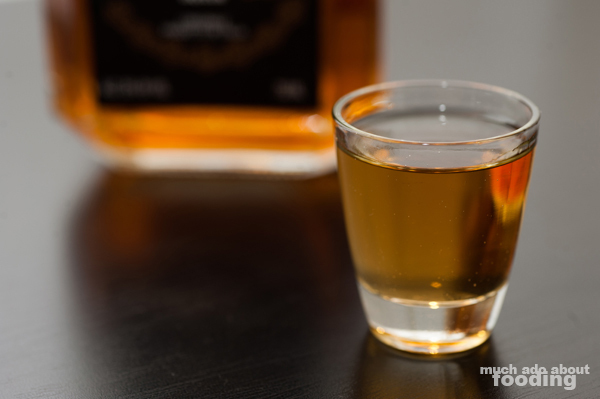 We haven't used anything alcoholic in a while in this Test Kitchen series so why not go with something fun for the summertime? Ideas are already popping up in my head but I'm wondering what your own ideas are. Share with us your suggestions or even what you just want to SEE be done with it. We're not asking for kitchen trade secrets after all, just some creativity.